and Darlene Jarman, in a tinsel dot knit rhinestone-trimmed swinsheath. 11: Audrey Garcia, in a rain costume for outer space -- carrying 'out of this world' show theme. 12: Chris Haskell, in a 2-way stretch knit swimsuit. 5: Darlene Peaks, in a polished cotton posy-covered box jacket and capri pants. 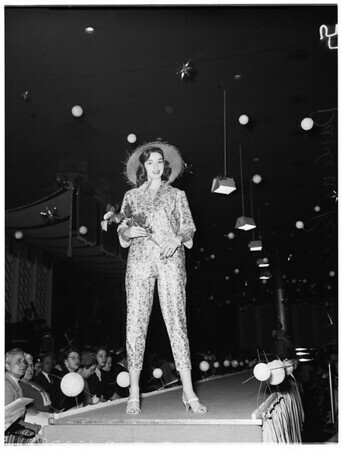 6: Darlene Jarman, in an imported silk mixture 'blue water lilies' sheath and sweater. 13: Holly Mitchell, in a cotton knit blouse tank top and matching striped shorts. 14: Darlene Jarman, in an embroidered Irish linen jacket-dress ensemble. 7: Chris Haskell, in a deep plunge wire brassiere and shirt-saver petticoat. 8: Barbara Sherman, in a cotton satin harem sheath featuring hipline pouf".